Alloy wheel repair helps keep you on the road – and looking good while you are on the road. The repair option is generally much less expensive than purchasing a replacement wheel. Or, at times when a single matching replacement wheel cannot be located, repair is much, much less than replacing a set of four wheels. Alloy wheel repair is sometimes the only choice when replacement wheels are hard to find or have been discontinued. The bottom line with alloy wheel repair is that the repair is always much less expensive than replacement. Additionally, when repaired, in most situations, the repair is undetectable. 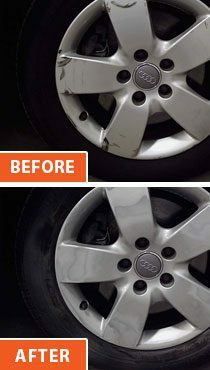 When you have common scuffs and scrapes that often come from city driving, Auto Color’s expert technicians will help you keep looking good with superior alloy wheel repair. Alloy wheel repair has its limits. If a wheel is cracked, or broken or bent, they cannot be fixed…by anyone. Repairs are generally done to the finish. Aluminum is not metal that can be repaired if cracked or broken. And if bent, does not have the properties needed to be bent back in shape and withstand the rigors of the road. If you have any questions about alloy wheel damage, visit us at our shop and we’ll be happy to help assess your situation.